Chairman, Independent National Electoral Commission (INEC), Prof. Mahmood Yakubu, has disclosed that soldiers would not be deployed in the election. Yakubu, who stated this in an interaction with newsmen in Lagos, said the police remain the lead security agency in the country, and not the army. He said: “INEC is determined to protect the integrity of our elections, and people should discountenance anybody beating the drumbeats of war. “We are working to provide adequate security for the voters, our staff, and election materials in the over 2,100 polling units. He explained that the commission would collate results at the 177 wards, and transfer to the 16 local government areas, from there the scores would be transmitted to the state’s collation centre in Ado-Ekiti, where the final results would be announced. “Already, all non-sensitive materials have been delivered to Ekiti, as part of our preparedness for the election, while the sensitive materials are in the vault of the Central Bank of Nigeria (CBN), and ready to be moved to the CBN branch in Ado-Ekiti,” he said. The chairman added: “Every post-2015 elections had been a litmus test for INEC, asking, when are we going to pass the litmus test? “When we conducted the Kogi election, it was a litmus test, so was the Bayelsa poll. When we had a hitch-free election in Anambra, it was still a litmus test. 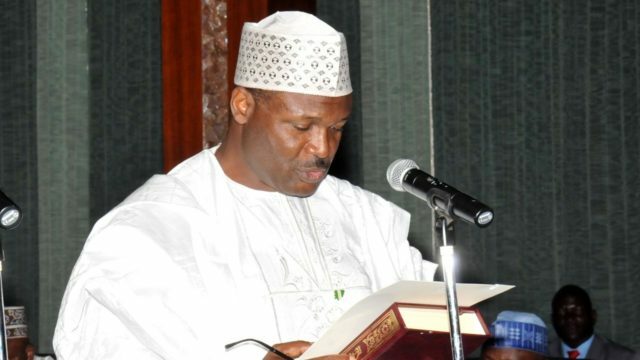 On why INEC was yet to conduct bye-election to fill vacancies created by the death of some lawmakers, Yakubu said the commission was yet to receive notification of those vacancies. He explained that while INEC had the responsibility to conduct bye-elections to fill vacancies in National Assembly and state Houses of Assembly, it had to be notified of such vacancies. At the moment there are three vacancies in the National Assembly and two in the Houses of Assembly of two states. He disclosed that the Senate lost Ali Wakili, representing Bauchi South in March, and Senator Mustapha Bukar (Kastina North) in April, while the House of Representatives lost Buba Jubril, representing Lokoja/Koto Constituency in Kogi State. He added that Hosea Ibi of Takun I Constituency died in the Taraba House of Assembly in January, while Stephen Ukpukpen of Obudu I Constituency in Cross River House of Assembly also died in March. Yakubu further explained that the procedure for bye-election is that the presiding officers of the various legislative houses would communicate to the commission declaring vacancy “on the basis on which INEC would conduct the bye-elections within 30 days.